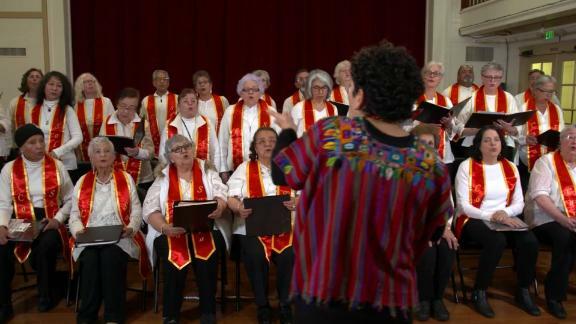 A University of California, San Francisco study reveals older adults who sing in a choir for six months have reduced feelings of loneliness and increased interest in life. Isabel Heredi took her place among the altos. "When we sing, we feel this emotion of happiness and enjoyment," said the member of the 30th Street Older Adult Chorus. With kind eyes and a voice shimmering with joy, she embodies the conclusion of a recent study called "Community of Voices." "We discovered that older adults singing in a choir for six months had a reduction in their feelings of loneliness and also an increase in their interest in life," said neuroscientist Julene Johnson of the University of California, San Francisco. The university, along with the nonprofit San Francisco Community Music Center and the city's Department of Aging and Adult Services, tracked 400 older adults in the study. A previous study at UCSF revealed that people over 60 who felt lonely had a 45% increased risk of death. "We think that the arts are particularly innovative for helping to improve health inequities in these communities," said Johnson. Heredi agreed as she spoke to CNN after choir rehearsal. "Having a schedule, having to go out and enjoy what you are doing is very important, and singing has additional importance because it has an emotional component." Choir member Annelise Mitchell says singing has enhanced her social skills. "I sing in two choirs, so I'm around a lot of people and I'm getting better at talking to people." The study resonated so well that the participants continued with their choirs after the research ended. "We heard from members how the choir had changed their lives and how they wanted and needed to keep singing," said Maria Cora, older adult program coordinator for the San Francisco Community Music Center. The organization obtained a grant to keep the music flowing. Cora said some members have extended their musical interest. Singing has emboldened them to learn to read music, play an instrument and even enlist a vocal coach. Meantime, the National Institutes of Health has funded a manual to help other communities launch their own choirs and spread the same palpable glee Isabel Heredi intones whenever she steps on to the risers. "I'm so glad to be in this choir," added Heredi.